I didn’t want to do this again, because writing about my issues with being in the media falls into a category of things I qualify as “problems that are not real problems”. Before I begin, I would also like to clarify something: last week I said I was a reluctant ambassador to Detroit. What I said has nothing to do with how I feel about Detroit, and everything to do with my being a non-native Detroiter. I haven’t lived here long enough to adequately represent the city, and I make no bones about that being the case. The problems I have with certain articles I have been interviewed for are not the problems of Detroiters, and they wouldn’t make it on to a list of my top fifty biggest problems as a human. However, this feels unavoidable, so here goes… Last week, a piece came out in the New York Times style section entitled “Last Stop on the L Train: Detroit”. I was interviewed for the piece by Jennifer Conlin months ago, and she made a big deal of ensuring me that it would not be another “Detroit is the New Brooklyn” piece, and she had told her editor as much. I first saw the article because it was linked in my Twitter mentions, and the first thing that hit me was a feeling of betrayal upon reading the title. As I said last week, regarding the article in The Telegraph, I know that journalists have little to no control over titling. Overall, the piece highlighted the arts in Detroit in contrast to Brooklyn’s rapid gentrification and subsequently unaffordable nature. I’m not upset at the article itself, but I do have some pointed follow up questions for some of the people Conlin interviewed. My favorite quote in the article came from Dream Hampton, when she said “If you look around and find yourself in an all white space, you should know you are having a racially curated experience, like a Kenyan safari”. It perfectly captured the way I have felt in Detroit when I find myself as one of a handful, or the only person of color. I look around and think: what city am I in right now, because it’s not Detroit. While I could write a 5,000 word essay on the insidious violence of what it means to create white enclaves in a predominantly black city, but instead I will screen cap Conlin’s tweet about the article, get on my Zebra Katz, and then get to the point. While Conlin disavows the notion that Detroit is the new Brooklyn, the phrase “urban pioneers” is perpetually problematic especially in this city. Let’s all just take a moment to remember the original “pioneers” who came through Detroit. That’s the Mt. 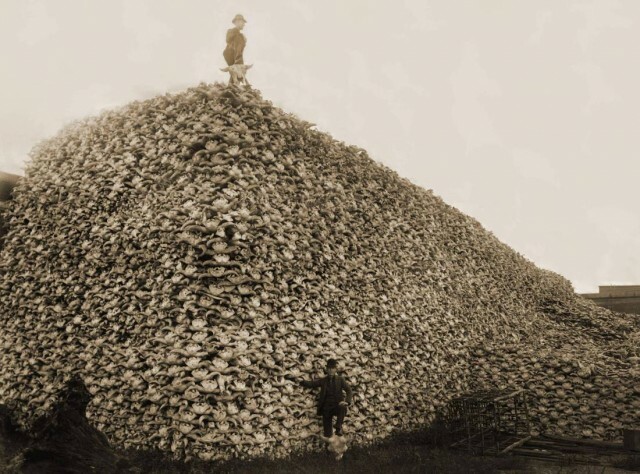 Mckinley of buffalo skulls waiting to be turned to fertilizer, and that is only the tip of the iceberg when it comes to the genocide of Native Americans. The issue with the idea of pioneers is that historically they are treated as if they discovered something. Detroit has been here. People live here, have lived here, have raised generations of their families in Detroit proper. No amount of cheap studio space is going to allow artists or anyone else to move in and act as if they found something new. And to be very clear, it’s not brave or bold, it’s strategic opportunism. That’s how I got here, too. I saw the opportunity that Write A House offered, and I went for it, and I don’t regret it one bit. However, I’m not going to treat my blessings like I’m out here playing Oregon Trail with reality. I had intended to write this week’s post about Kresge’s 2015 fellowship awards ceremony, not this, and then Rick Rogers, president of the College for Creative Studies, referenced the article in his opening remarks. My friend Sarah Rose Sharp, one of this year’s fellows, invited me to the ceremony as one of her guests. I met Rosie at a reading we did together as a fundraiser for one of the tracks at the Allied Media Conference. She came up to me afterwards and invited me to coffee, and when we met at Café 1923, I realized she was just my kind of weird—witty and insightful and having thought a great deal about zombies. I intended to go into the ceremony, meet some new people and convince people to let me interview them for a project I’m working on. It took less than ten minutes in that room for me to feel fully liminal, between two worlds that exist on top of one another in Detroit. As I was standing in line for the bar, I turned to see my friend Randal entering the room. Like Rosie, I met Randal through a reading we did together earlier this year for the Motor Signal series. I liked Randal immediately because upon meeting him, it felt as if he was saying “Hi, nice to meet you, this is what I’m really like”. When I saw him at the Kresge Awards, he looked phenomenal as he always does. He came up and said hello, and then said that he had been thinking of me earlier that day, although he couldn’t quite remember why. After a minute, he recalled that he had been writing earlier that morning. He then further explained that the previous night, he had watched a teenage boy get shot on Trumbull Ave, not far from where he lives. He said four or five cars passed by before he did, and he stopped. He took the boy, his sister and his friend to the Emergency Room. The police did not question him as a witness, even though he had seen what happened. They instead searched his car as if he was somehow involved in the shooting. That last detail made me angry enough to want to lob my wine glass against a wall. He wasn’t sure if they boy had survived. We sat with one another during the ceremony, and when Rick Rogers made reference to Conlin’s NYT article, Airea D. Matthews (another 2015 Kresge fellow and close friend) turned around to look at me. She knew the article had gotten under my skin. I, in turn, gave Randal the side-eye and sipped my glass of wine while he suppressed a laugh. Rogers pulled out a few quotes from the article, beginning with something I had said, which was that Detroit was about collaboration. It hit me like gravity. In the past eleven months, the people who are paying attention to what I say have continuously surprised me, and the moment was humbling. Rogers also quoted artist Ben Wolf when he said “I came here thinking I might help save Detroit, and instead it has saved me,” and Marsha Music announced to the room that Wolf had gotten that quote from her. While we all laughed, I’m of the opinion that Marsha Music is the truth, and I am certain it was not an exaggeration. And isn’t that really what the issue is? One version of Detroit on top of another, and who is really being saved? The reason I had wanted to write about the Kresge fellows is because I am a firm believer in art as a vehicle for change, and because I appreciate the work of so many of the people honored this year, but it would be disingenuous of me to write this any other way. In the two days that have passed since the ceremony, I have spent far more time thinking about the boy, how he could be one of my students, my brothers, or myself than I have about art “revitalizing“ the city. Randal has said to me more than once that he doesn’t consider himself to be radical. I have countered that the way he looks and exists in the world is in and of itself radical, but I understand what he means: he’s not an activist in any traditional sense. As we said goodbye, he said something that stuck with me, which was: “People talk about Black Lives Matter, and this was a physical representation of that”. He talked about what it meant to find purpose in Detroit, and how he had almost been in New York the night before the awards. Then we reflected upon the fact that we were standing just feet away from some of the most important figures in the Detroit arts community and forever closer to the boy.